Does the Ring turn Sauron invisible? How come the ring doesn’t make Sauron invisible? The Ring doesn’t actually make someone invisible in the sense we understand the term. It shifts its bearer into the world of the Unseen (which is why it can’t hide Frodo from the Nazgul on Weathertop–they already dwell in the World of the Unseen). As a former Maia, Sauron simultaneously dwells in Middle-earth and the realm of the Unseen–so the Ring would not make him invisible. Surely we haibane can contribute to this critical topic. What say you all? Agree or disagree with the theory above? Works for me. It takes into account all that I’ve read about the nature of Sauron, and if one accepts the duality of seen/Unseen, then it makes perfect sense. I don’t think that’s the answer. The Ring is sentient, and acts to further Sauron’s cause. This might include turning invisible (and simultaneously visible to Sauron’s loyal Nazgul), to be useful to Bilbo, Frodo, and Golum, so as to tempt them into wearing and using it continuously. Or it might do entirely different things. As Lord of the Rings, Sauron can probably turn the invisibility power on or off as he chooses. This is completely correct imo; the ring only makes its wearer invisible to ordinary beings of other races – one reason why Gollum survived so long underground with the goblins all around him (which also allowed him to feed on them). It actually exposes the wearer to the Eye of Sauron and of course attracts other ringbearers – in particular the Nazgul to it (of course the Nazgul can see the bearer anyway, but putting the ring on, focuses them on him/her much more). 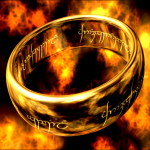 One of the most intriguing things about the One Ring, is that its power is never really outlined – I mean what does it do that makes it so powerful when Sauron wears it, is never really clearly explained. Here Peter Jackson’s film makes a fatal flaw, when it portrays the Ring as giving Sauron some kind of extra supernatural physical power – in books it didn’t work out that way. Actually reading Tolkien shows that Gil-galad and Elendil wrestle and kill Sauron’s physical body while he still wears the Ring, (though they both die as a result) Isildur cuts the Ring off Sauron’s hand after he is dead, well at least physically, and then we are told his ‘spirit’ fled. Even in that war, Sauron’s forces are besieged and the resulting battle is a stale-mate before Gil-Galad and Elendil venture forth for their personal combat with him – so the Ring doesn’t make its original bearer superhuman, omnipotent or even unstoppable. It does confer power on Sauron, though what exactly that power is, except for being able to manipulate the other Ring bearers (except for the holders of the Elven Rings) is not made clear. I think this is where we can see elements of Tolkien’s Catholicism, for he was a deeply religious man, at play. The Ring stands for a form of Evil, akin in some ways to original sin; it is never direct and never confers power immediately but does corrupt its holder. Which is why men always fall prey to it first and quickly – as they are seen as the weakest of all the races, it is notable that none of the Dwarven ring bearers enter Sauron’s service (though Tolkien uses a bit of escape device to say all these rings are lost) and the holders of the Elven Rings (two cases elves Galadrield and Cirdan) do not succumb to the temptations of power; rather like the conception of evil in this doctrine, it works from within corrupting and twisting its holder – surrendering to it, is what allows Evil to win. Which is why Sauron, is one of the most absent-villains in all fiction, we hardly every see or hear from him directly; all the action and the fighting is done by his subordinates and he is destroyed once the ring is too. Like the nature of Evil in Catholic doctrine, it remains something outside what direct consciousness can perceive, like a darkness and an imperceptible malevolence, that can see us but which we cannot see much of – hence most incarnations of Sauron are highly symbolised like the Eye and the shadows. Though I’d disagree with FhnuZoag and say the Ring isn’t properly “sentient” (in that it can’t make long-term plans, or think analytically) – it’s just got a blob of Sauron-essence in it. That makes it, for instance, try to get its possessor to put it on, to thus corrupt them and (given the whole “putting them in the realm of the Unsees” part) making them easier for Sauron and the Nazgul to see. (And being able to sense their presence, it tempts Frodo to put it on when he faces them in the Shire and later). But that’s modelable more or less an autonomic reaction, without resorting to sentience. That explains why it couldn’t, say, compel Gollum to just take it to Angmar or Barad-Dul the moment Sauron got his body back, and make the whole story both much shorter and more unpleasant. Keep in mind that it’s stated in the books that Sauron had no direct role in forging the Elven rings and never touched them. That’s why the wearers of the Elven rings don’t have a temptation to succumb to evil, because there is no evil in those rings. I read the books as a kid and watched the movies as they came out and just re-watched the movies again with my kids. I certainly don’t think the original book ever “showed” the battle sequences in which Sauron “wore” the ring – the movie is forced to be rather literal in portraying this event, as it also shows the ring shrinking to accommodate a smaller wearer’s finger. How much ability does the ring have to shrink or grow and what is the default size it assumes? I think it would be funny if it retained its original large size, rendering it even more difficult to carry for the hobbit Frodo – haha! As far as it’s magical abilities, the invisible question is also tough. Why did they have to torture Golum to get “Shire” and “baggins” when the ring calls out to Sauron and Bilbo wears it at his birthday party – wouldn’t that have been enough time to see where it was? Also, why does Bilbo start to age almost immediately after he stops possessing the ring, but Golem goes on and on? I don’t worry too much about these questions, but love that people find it interesting and discuss it… can’t wait for the Hobbit movie. The reason why Sauron didn’t sense the Ring was because he had not come into power again yet, and The Eye was not fully formed. Gollum goes on, and on, because he possesed the Ring ALOT longer. It makes him WANT it i so badly that his soul won’t die untill he has it again. 500 years is a long time to have The One Ring. Bilbo only had it 50 years. Conrad Barwa is right, that the Ring doesn’t make you invincible. If it did Frodo could have just killed the Nazgul on Weather top because he was invincible. The shrinking, and growing was never mentioned in the books. I geuss it was Peter Jacksons way of saying that the Ring already senses a new bearer, and forms a “plan” so to speak to get back to Sauron by using that person. To Sigivald: The Ring has Sauron’s own blood in it. It DOES think like Sauron. He put the molten gold in his hand and plunged a dagger into his hand to let the blood flow into the gold. Look it up in a book called Lord of the Rings Weapons and Warfare. Cirdan is not a ring bearer for long. 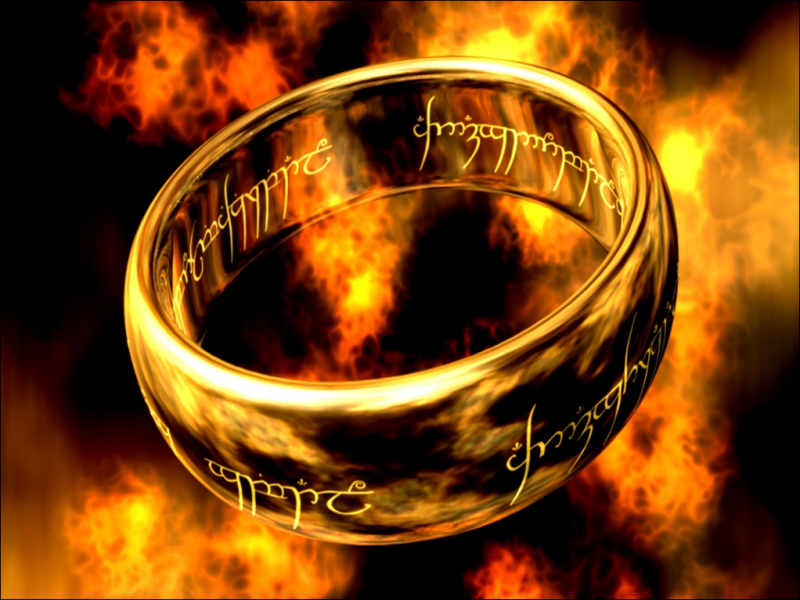 He gives his Ring to Gandalf, and its name is Narya The Ring of Fire. Galadriel has Nenya, and Elrond has the third ring. It strikes me as funny, how Sauron has Hundreds of thousands of orks, the Nazgul, the wild men, the easterlings, Saruman and his orks, and the Haradrim, and The Great Eye, but Gollum gets hi “Precious” back all by himself. In the Hobbit he calls the Ring “My birthday Present”, and calls himself Precious. If any body is wondering, Gandalf Tel Celeb means, Gandalf the Silver. I think that silver is a cooler coler than White. No, it did not cause Sauron to become invisible in the conventual sense. Sauron created the One Ring; therefore he not only had control of it, but complete mastery of the Ring. Sauron is not just a simple Necromancer, but a Maia; a divine being of the same class that Gandalf, Sauruman and the other wizards are. The Maiar are effectively angels in physical form. Sauron was the greatest of this class of beings before becoming increasingly tied to Middle-Earth by continually dwelling there in and expending his divine powers. “The One Ring was forged by the Dark Lord Sauron during the Second Age in order to gain dominion over the free peoples of Middle-earth. In disguise as Annatar, or “Lord of Gifts”, he aided the Elven smiths of Eregion and their leader Celebrimbor in the making of the Rings of Power. He then forged the One Ring himself in the fires of Mount Doom. Sauron intended it to be the most powerful of all Rings, able to rule and control those who wore the others. Since the other Rings were themselves powerful, Sauron was obliged to place much of his own power into the One to achieve his purpose. Next Next post: Will the Apple tablet be a Kindle killer?